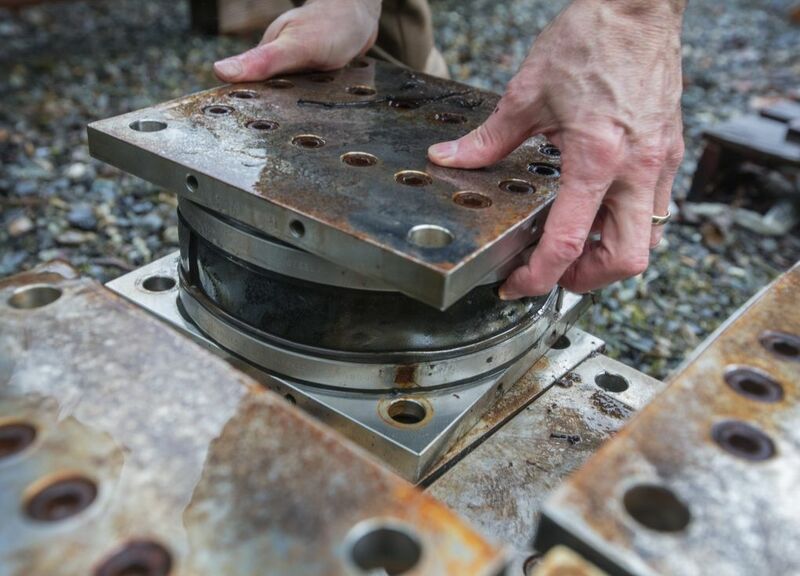 Sound Transit’s consultants have invented a flexing track connection, using earthquake science, to safely move future light-rail trains on the I‑90 floating bridge. 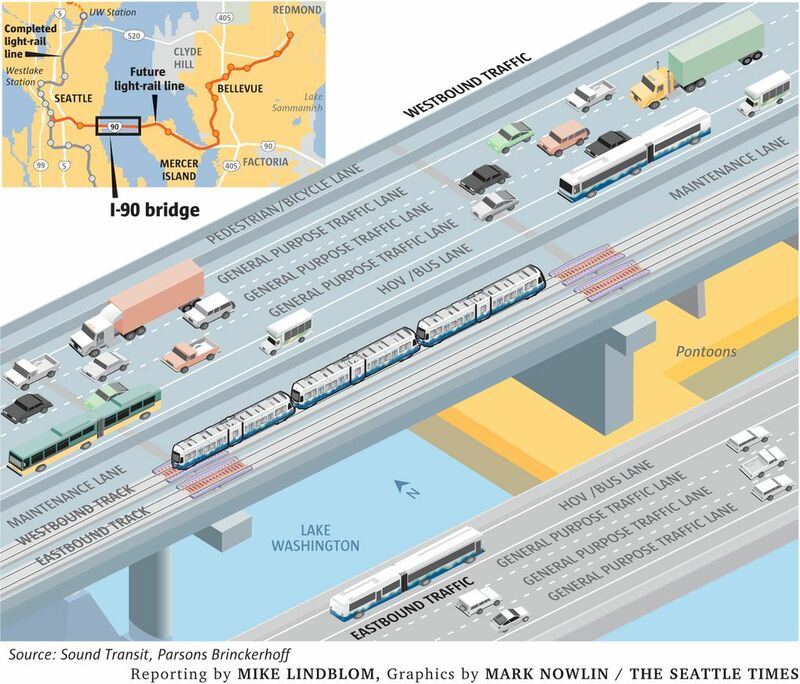 Sound Transit will soon try something unprecedented — building and operating train tracks on a floating bridge. 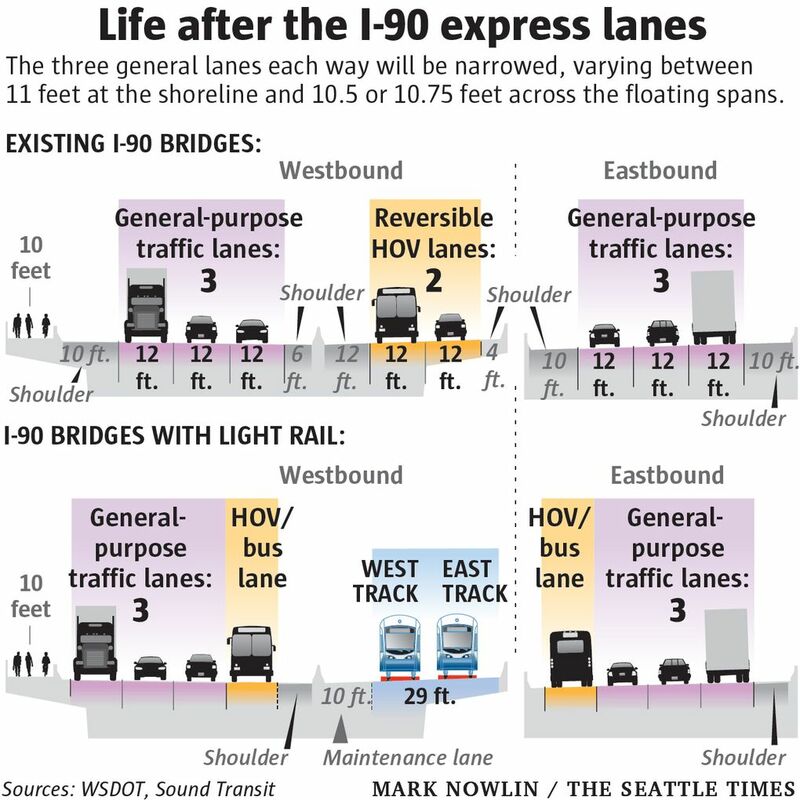 The work begins June 3 in the center express lanes of Interstate 90, after carpools, buses and Mercer Island motorists are kicked out to make room for light-rail contractors. Passenger service between Seattle, Bellevue and Overlake is scheduled to begin in 2023. The technical challenges are daunting. Lake levels rise and fall two feet a year. Waves, wind and traffic create slight twisting. A full train is heavy enough to plunge the pontoons eight inches. So the railbed must both resist and absorb roll, pitch and yaw. A derailed train could sink 200 feet to the lake bed. If track components break or wear out, transit service would be halted for maintenance, or subjected to slowdowns. The good news is, engineers have invented and field-tested a new kind of rail joint they say will provide a smooth ride at full speed, instead of a reduced rate of 30-35 mph as once feared. It borrows a philosophy from earthquake planning: Don’t fight the forces. Instead, thousands of trains will roll atop the same kinds of high-strength bearings that allow buildings and fixed bridges to flex in a quake. Just in time for scheduled construction, Tom Baker, chief bridge and structures engineer at the Washington State Department of Transportation, signed off on the final design in April, affirming light rail will be safe and not wear out the bridge prematurely. Sound Transit took a calculated risk in 2008, when it sent the cross-lake corridor called East Link to voters in the ST2 sales-tax measure. Way back in 1976, federal and local government leaders signed a pact that high-capacity transit, either rail or bus, would someday be added to I-90’s Homer Hadley Bridge, the north span that includes express lanes, completed in 1989. Bridge engineers assured it would be stout enough for trains, but they deferred the questions about bridge hinges and motion to future generations, recalls Chuck Ruth, a structural engineer on that team. WSDOT later simulated loaded trains by driving flatbed trucks loaded with concrete slabs across I-90, for three nights in 2005, to ensure the bridge could handle the weight. Nonetheless, state review panelist Alan Kiepper, retired president of New York City Transit, worried in 2006 that heavy trains would load the span to 97 percent of capacity. 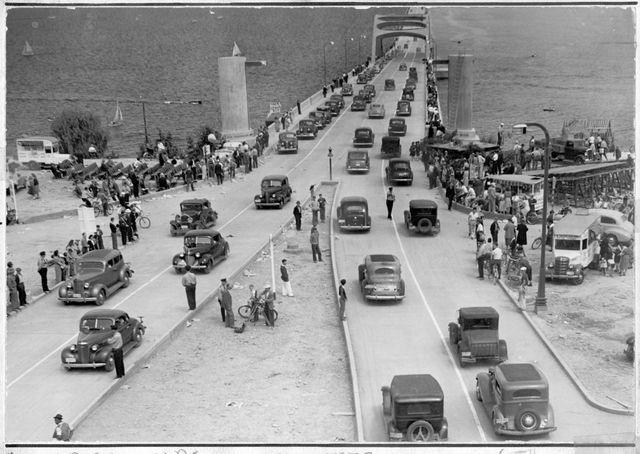 He even mentioned the original Tacoma Narrows Bridge, the infamous Galloping Gertie, which collapsed in 1940 in a case of hubris by engineers. The panel concluded the project was still possible. Redmond Mayor John Marchione, a longtime transit-board member, recalls being nervous enough that after the ST2 win in 2008, he said in speeches that if the crossing didn’t work, he’d settle for a Redmond-Bellevue segment, to serve Eastside-only trips. “I feel more confident,” he says now. “I’m never going to feel 100 percent confident until they get the real train on the real track. Sound Transit never proposed going around the lake, preferring a direct connection between Seattle and Bellevue. Fortunately, the express lanes are protected from common storms from the south, by the other I-90 span. Train service would be halted in a sustained north wind of 40 mph or higher, which happens once a decade, or a south wind of 50 mph. Starting June 3, the state will be making the three general lanes each way a few inches leaner mid-lake, so the shoulders can be wide enough for emergency responders during crashes or stalls. A new high-occupancy vehicle lane will be added in each direction, to make up for losing the reversible express lanes. Train service via I-90 begins in 2023. To keep buoyancy, some ballast gravel will be removed from the bridge pontoons. 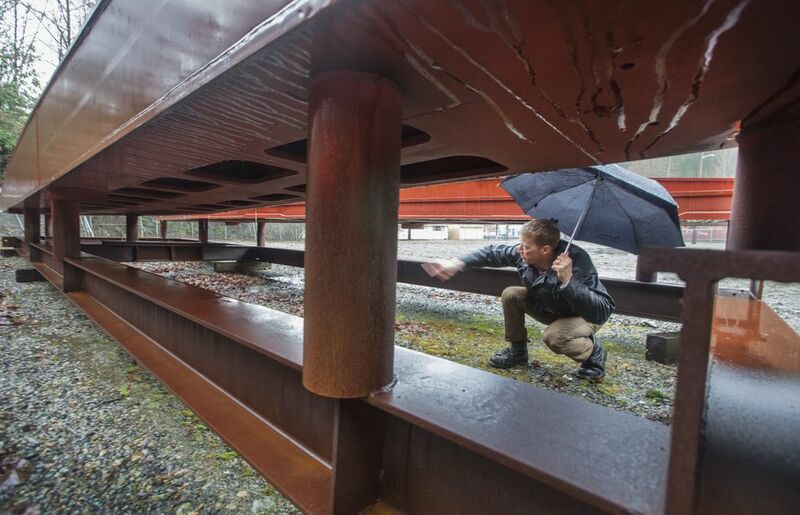 But the critical points for safety and comfort are eight 43-foot-long “track bridges.” These steel devices soften the angles where rails will cross over hinges that connect the floating and fixed structures. That way, the trains won’t go ka-thunk. During the 2008 campaign, transit executives showed the public a conventional “three beam” solution, where a sliding segment of track moves east-west, between fixed track pieces on either side. It’s like interlacing your fingers. To show the I-90 project was possible, transit officials cited Vancouver, B.C., where Sky Train crosses a cable-stayed Fraser River bridge, and trains in Lisbon, Portugal that travel on a suspension bridge. However, their movements are mainly lengthwise and less variable than the I-90 bridge. Sound Transit’s own engineers worried that sliding east-west rails would need to be hugged by springs on either side, to control north-south shimmying. Those springs can wear out. Under that design, trains might even have to go half-speed. While studying that dilemma, a track design specialist in England named Andy Foan conceived another solution. 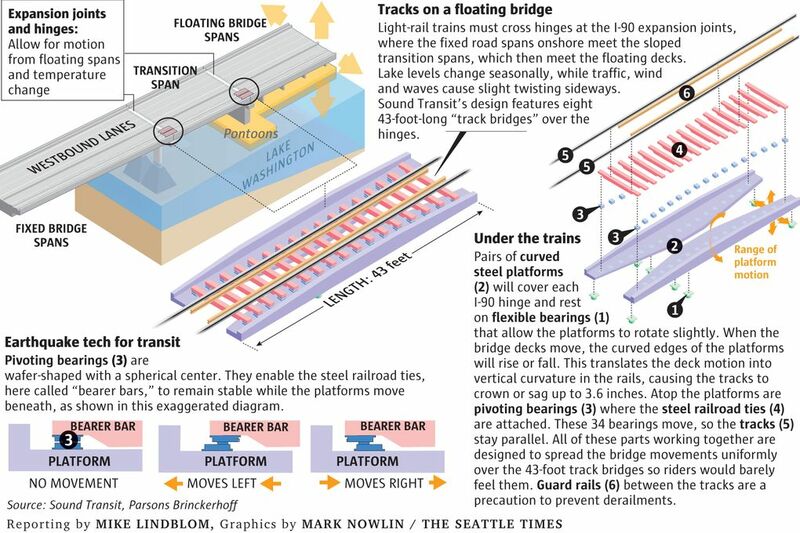 If the I-90 tracks rested on twin curved platforms, set side-by-side, those platforms would rotate slightly when lake levels change. The rotation would cause the rails to either crown or sag a few inches, evening out the movements of the decks and hinges across the 43-foot rail section. That ought to be more durable than three-part sliding tracks. “The invention was born of necessity,” Foan recalls. Foan’s ideas were near impossible to depict in words. On a Seattle trip, he gathered wooden stir sticks from a downtown cafe and built a makeshift model for engineers. “We’re not worthy!” thought John Sleavin, a senior technical director at Sound Transit. Next came computer models, two prototypes, component testing at UW, and finally live trials with full-sized, two-car trains at a railroad research facility in Pueblo, Colo.
“I think they tested everything they possibly could to have the biggest assurance of success with the track bridge system,” says Ruth, who chaired a WSDOT panel and later worked on the engineering team. Even a one-eighth-inch error could throw components off balance. Steel bars and even some bolt holes needed to be repositioned, according to Travis Thonstad, who documented the tests in his UW master’s thesis. Eventually the system worked, even at three times I-90’s normal twisting. Of course, the rails themselves need to stay parallel, despite all the other motion. How? Under the rails are sets of crosswise steel bars, like railroad ties, to hold them in place. These ties sit on bearings that rock and roll in all directions, but only a couple inches. The curved 43-foot platforms also sit on pivoting bearings. They will adapt to bridge motion, and isolate train riders from the vagaries of the lake. “I’ve never seen anything like it before. I don’t think the world has seen anything like it. It’s a brilliant solution,” says John Stanton, a University of Washington civil-engineering professor and seismic expert who observed some of the design work. A similar principle protects Seahawks and Sounders FC fans at CenturyLink Field. Bearings under the roof columns allow it to “give” during a quake so the roof won’t be whipsawed by ground motion. Because the I-90 trains will roll across 34 bearings per hinge crossing, each shoulders only a fraction of the weight, an advantage for safety and durability, Magnusson said. If any wear out, a crew needs about four hours to install a substitute, said Sleavin. He predicts they might never wear out. Dryland tests are one thing, but will this work on a lake? Participating engineers say every component has been safely used someplace else. Sound Transit is merely combining them in a new way. Only eight of the track bridges will be made, making quality assurance difficult, Stanton says. By comparison, a Boeing jet undergoes exhaustive flight tests followed by thousands of identical units sold to customers, who give constant feedback, he said. He praises a decision to assemble the track bridges in controlled conditions at Jesse Engineering in Tacoma, and truck them whole to I-90, so movements and weather don’t mess up the installation. Before passengers cross the lake, the trains will run at least three months empty, as track movements are constantly recorded. 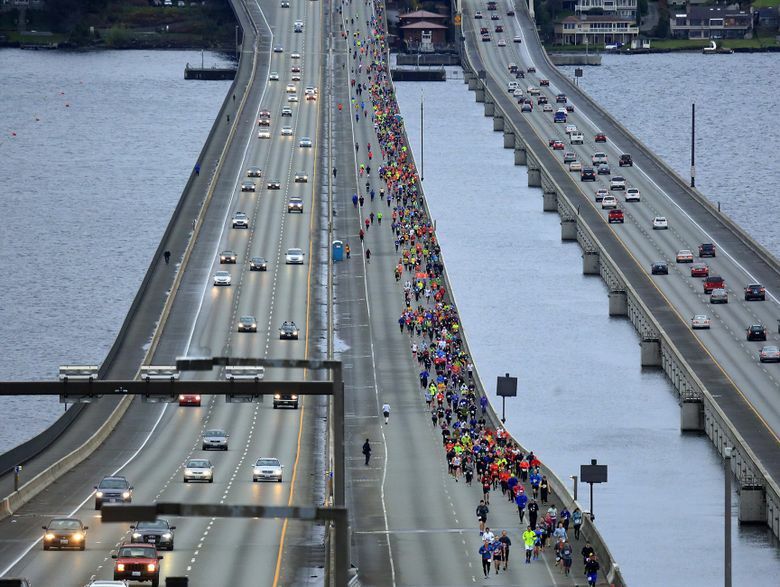 Opponents like him still argue that WSDOT was foolish to sell off two express lanes of freeway capacity for a bargain price of $173 million to Sound Transit. The deal was challenged by Bellevue developer Kemper Freeman but affirmed by the state Supreme Court. An additional $283 million is being spent to squeeze high-occupancy lanes into the freeway mainlines, as a prerequisite to moving buses and carpools out of the future train deck. Now that the full design is known, Sound Transit had to increase the construction contract by $225 million to a total of $712 million, to build trackway and two stations from Chinatown International District to Bellevue Way. That will eat into the project’s contingency funds. The entire 14-mile corridor from Seattle to Overlake, including stations, trains and signal systems, is budgeted at $3.7 billion. Despite the expense to tame the lake, the I-90 crossing will cost far less than building another bridge. The lake is considered too deep to install columns for a fixed bridge. It’s also too deep for a tunnel under the lake or along the lake bottom. 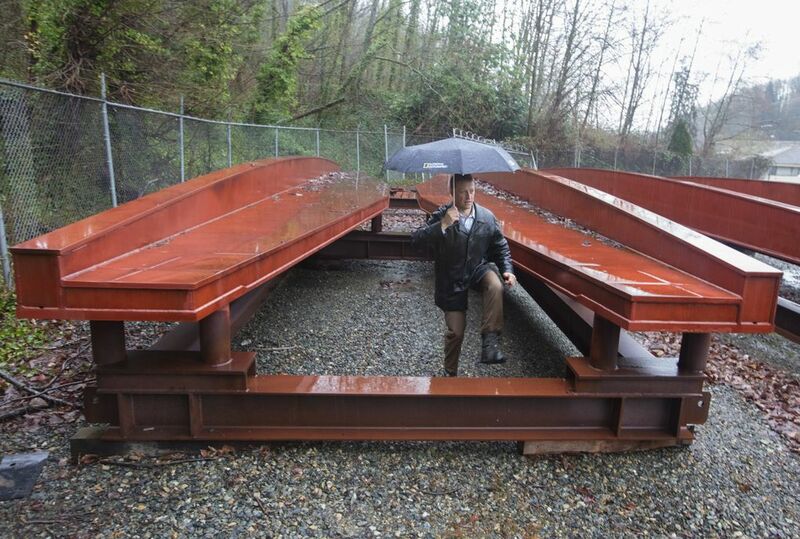 A train-only floating bridge would require pontoons far wider than the 29-foot railbed, to spread the weight. “It’s cheaper to do the rail and road bridges together than to separate them,” Marchione said.